Browse our 1,000 plus easy to follow PINOY FOOD RECIPES with PHOTOS. Tidtad, Dinuguan Kapampangan. If you like the Dinuguan of Rasons or Teresitas, soupy with cubes of blood, then you are a Kapampangan or you already know that it is called Tidtad, Dinuguan Kapampangan. To my readers that are not into pig blood, I would like you to skip this post, please check my other recipes on the archives. 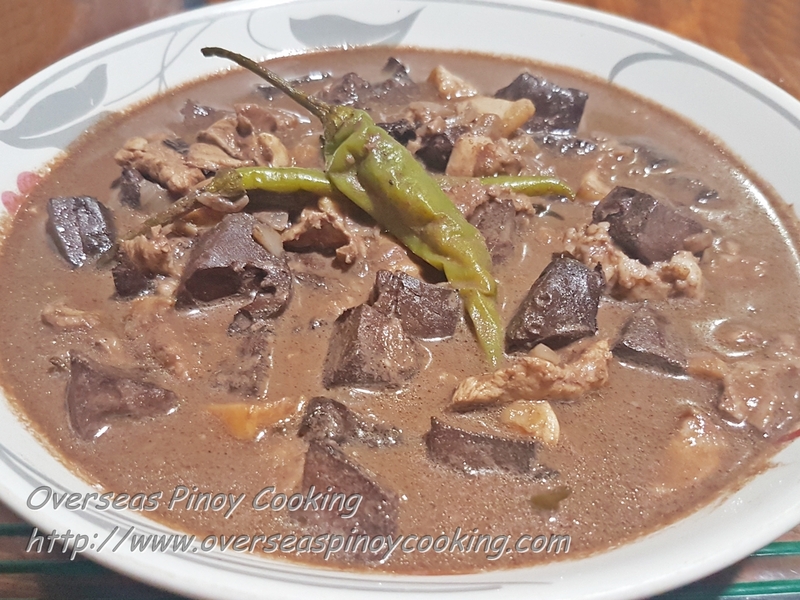 Today I would like to share my take of Tidtad, Dinuguan Kapampangan. This is my own version I am not saying that it is how it should be cooked. 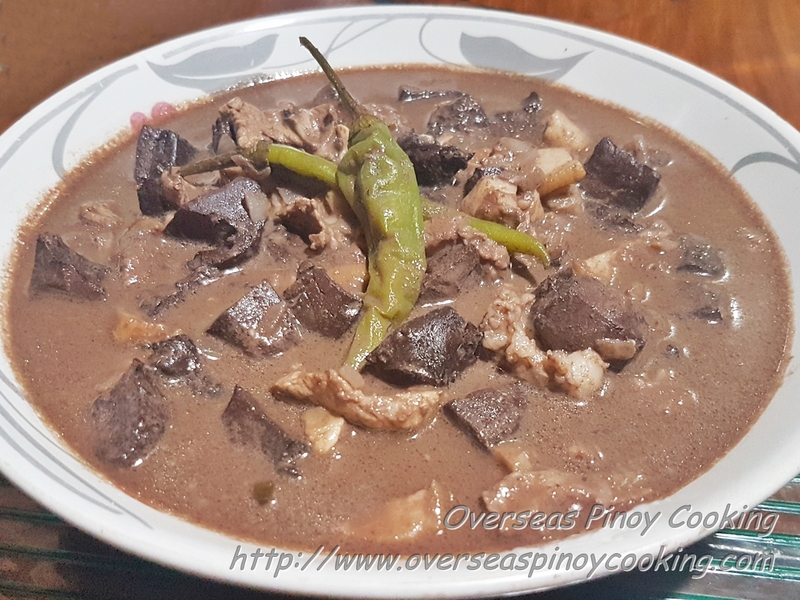 Similar to other Dinuguan recipes, there are countless versions of Dinuguan out there, each version depends on locality, personal preference and availability of ingredients, ect. I am lucky that my favourite supermarket, the South Supermarket Filinvest Alabang branch regularly give away fresh pork blood. It is a first come first served basis therefor I have to be at the supermarket early. I am sure that the fresh blood from my supermarket is way cleaner compared to the one’s offered at public wet markets. 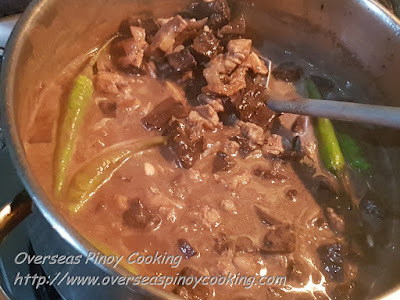 I am not going to write about Tidtad, Dinuguan Kapampangan, instead with this post I have included below a video about Tidtad, Dinuguan Kapampangan. The video is from GMA’s Saksi Midnight Express. Here is the recipe of my version of Tidtad, Dinuguan Kapampangan. In a large sauce pan, put head, pork belly and intestine and add enough water to cover pork, add the whole garlic, 2 bay leaf and crushed ginger. Let boil and simmer for 15 to 20 minutes. Drain and rinse pork. Debone head and cut meat into 1/2“ cubes, keep aside. Cut pork belly into 1/2“ cubes, keep aside, Cut intestine into 1/2” crosswise, Wash thoroughly, rinse and drain, keep aside. In same sauce pan sauté garlic and onions. Add pork including the intestines, soy sauce, patis, bay leaf and crushed peppercorns stir cook for 3 to 5 minutes. Add in vinegar, lower heat and simmer. Now add 2 to 2 1/2 litters of water. Bring to a boil and simmer for 10 to 15 minutes or until tender. Add more water as necessary. Add in the coagulated fresh pork blood, let boil and continue to simmer for 3 to 5 minutes. Take out the now solid coagulated pig blood from the pan. Cut the solid coagulated pig blood into small cubes and return to the pan. Correct saltines if required. Add in the long green sili and simmer for another 2 to 3 minutes. Serve hot with a lot of rice. Have anything to say or share? Place your comment or reaction now. Show up to max. 10 post per page, Click OlderPost or NewerPost links if required. No reproduction of contents of this site like Photographs, Recipes, and other Articles with out prior written permission. HOW TO COOK FILIPINO FOOD? 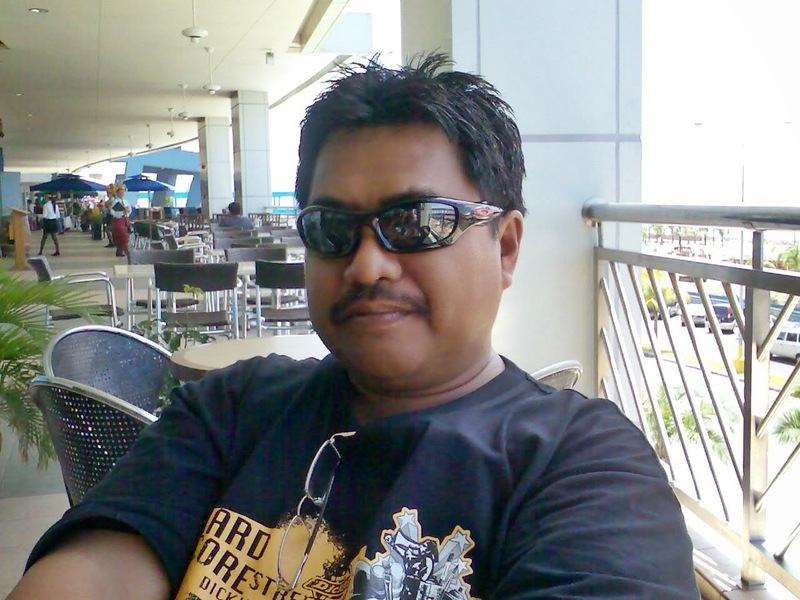 Over 1,000 Easy to Follow PINOY FOOD RECIPES with PHOTOS.